I am giving here thye photocopy of the article for the readers. I personally appreciate the correspondent of this feature writer that she have given the true and correct informations. Thanks to INDIANEWS magazine and thanks to related team writers. Today I recieved an e-mail, the photo-copy of the mail is enclosed here. The letter contains the important points and so that I would like to share the contents of letter for the benefits of the others victims of Leucoderma and Vitilago. I want to reply of the letter individually, but some important contents and the experiences of the patient, which I want to share with the other victims. This is a troublesome disease. I reply here to all concerns that this condition is totally treatable and curable, but the conditions are with the part of the patient and so also with the physician. Modern western medicine have no deciding role in the treatment of Leucoderma. Homoeopathy have some role in the treatment, but I am afraid to say that it may work and it may not. The treatment with the Homoeopathy is always with the suspence, uncertain and doubtful, it is because, if the novices Homoeopathic Physician deals the pqtient. I have seen that many case have been spoiled by the new commers of the Homoeopathy and then they came in condition of untreatable. So if you want to take the treatm,ent of Homoeopathy, you should go to experienced Homoeopath of old age. Second the part of the patient is also very important. The management and the treatment should be maintained by the patient including his living style, food habits, climatic conditions etc etc. 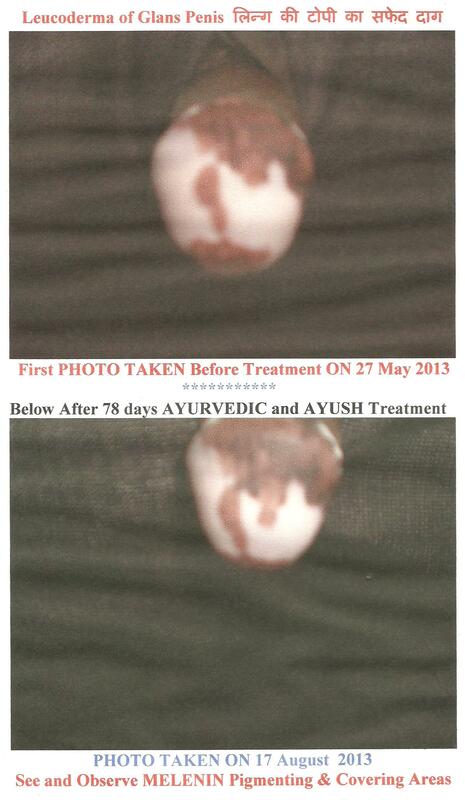 Generally , I prefers Leucoderma patient to take Ayurvedic medicines, which are safe, harmless and very effective. Ayurvedic treatment or Unani treatment are promising cure/ relief the diseased conditions. Regarding my way of treatment, my (1) first step is to go for Electro Tridosha Graphy E.T.G. Examination, without this examination , I can not take any further step. (2) After this examination, when I get all the Data, then I physically examine the diseased parts/ailments/syndromes conditions/normal and abnormal organs etc conditions and then after this varification select the medicine according to the findings of Ayurvedic tridosha and diagnosis. This is afoolproof method of the treatment, without any deviation, doubt or other uncertainity. Because ETG provides the pinpoint diagnosis of the disease, doshas, saptadhau, oj and other conditions. Management of the case is dependent upon the findings of the ETG , food habits , living styles are also instructed according to the findings of the patient. दिसम्बर सन १९८१, दिसम्बर १९८२ और दिसम्बर १९८३ में जब मै बम्बई पढायी करने गया था,उस समय मैं देव आनन्द से मिलने उनके आफिस गया था । लेकिन मेरा दुर्भाग्य कि मै उनसे नही मिल पाया । एक बार वे सूटिन्ग के सिल्सिले में देश से बाहर थे । बाकी मुझे याद नहीं कि उन्के आफिस बियरर ने मुझे क्या उत्तर दिया था ? आज भी मेरी तमन्ना देव आनन्द से मिलने की है, लेकिन मै चाहता हू कि मै जब उनसे मिलूं तो उनका एक ई०टी०जी० परीक्षण करके यह देखूं कि देव साहब का शरीर आखिर क्यों इतना हिलोरें मारा करता है और उनके अन्दर की कौन सी ऐसी नस और नाड़ियां है जो उनको हमेशा झक्झोरा करती हैं और चैन से बैठने नही देती ?